CHICAGO – It was Monday, Nov. 3, 2014 at 10:15 p.m. Leaving Navy Pier IMAX, I was driving north on Lake Shore Drive – a constantly busy, multi-lane highway that hugs the east of Chicago and separates it from water. What I saw next with fellow staff critic Patrick McDonald might have been normal for 3 a.m., but discussing Christopher Nolan’s new sci-fi “Interstellar” and being the only one on the road in either direction felt otherworldly. While certainly unusual, it speaks to my state of mind and how the film hit me with a ton of bricks. It felt epic and simultaneously intimate – being one of only a few dozen critics comfortably spread out among 440 seats – and could have only been experienced correctly on a 6-story, 60-by-80-foot screen. Don’t make the mistake of seeing this film in anything but IMAX. The problem with being Christopher Nolan is having to top himself time and time again. The three-time Oscar-nominated writer and director injected himself on the scene with 2000’s “Memento” and then went especially mainstream with “Batman Begins”. Continuing with “The Prestige” and eclipsing the $1 billion global box-office mark with “The Dark Knight,” “Inception” became Nolan’s biggest cerebral challenge. While “The Dark Knight Rises” and “Man of Steel” came next, “Interstellar” returns Nolan to the brains of “Inception” plus the epic splendor of “The Dark Knight”. Read Adam Fendelman’s full review of “Interstellar”. Think twice before even remotely comparing 2013’s Oscar-winning Alfonso Cuarón film “Gravity” with Nolan’s “Interstellar”. Aside from both taking place in space and there being a similar emotional relationship between Matthew McConaughey/Anne Hathaway and George Clooney/Sandra Bullock, they’re nothing alike. “Gravity” makes you feel alone while “Interstellar” feels huge. It’s challenging to view “Interstellar” as a copycat of another film and also impossible not to make comparisons. “Interstellar” more borders Danny Boyle’s brilliant 2007 film “Sunshine” with Cillian Murphy and Rose Byrne because it shares some of its “space madness” and goes to seriously out-there places. So does “Interstellar” reminisce back to “Star Trek: The Next Generation” with its focus on black holes, quantum theory and the space-time continuum. Along with others including Ron Howard’s 1995 film “Apollo 13” starring Tom Hanks, the genre always comes back to Stanley Kubrick’s 1968 masterpiece “2001: A Space Odyssey” with the intelligent computer H.A.L. 9000. And none of it would be possible without the sci-fi fathers Arthur C. Clarke and “Star Trek” creator Gene Roddenberry who dared to dream it all. “Interstellar” stars Matthew McConaughey, Anne Hathaway, Michael Caine, Matt Damon, Jessica Chastain, Topher Grace, Casey Affleck, Ellen Burstyn, John Lithgow, Wes Bentley, Mackenzie Foy, Elyes Gabel, Collette Wolfe, Leah Cairns and David Oyelowo from writer and director Christopher Nolan and writer Jonathan Nolan. The film, which is 169 minutes, is rated “PG-13” for some intense perilous action and brief strong language. The film opened wide on Nov. 7, 2014 and is also available in IMAX. Continue for Adam Fendelman’s full review of “Interstellar”. Anne Hathaway and Matthew McConaughey in “Interstellar”. 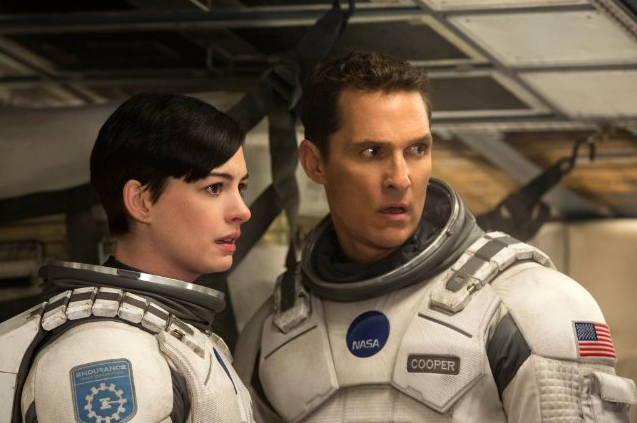 Film Review: ‘Interstellar’ is Supposed to Mean Something, But What?